Whole blood is made up of various types of cells suspended in a liquid called plasma. 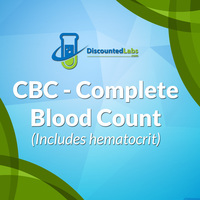 The complete blood count (CBC) is an inventory of the different cellular components of the blood: red blood cells, white blood cells, and platelets. Blood cell counts are typically reported as the number of cells in a cubic millimeter of blood (cells/mm3) or as a percentage of all blood cells. Red blood cells (erythrocytes) carry oxygen from the lungs to the body's cells, bound to a molecule called hemoglobin. Anemia is a condition characterized by a reduction in the number of red blood cells, often leaving a person fatigued, weak, and short of breath. Several tests are used to help diagnose various types of anemia. Hematocrit (HCT): the proportion of red blood cells as a percentage of total blood volume. A normal hematocrit is 40-55% for men and 35-45% for women. Hemoglobin (HGB): the number of grams of hemoglobin in a deciliter of blood (g/dL). Normal levels in healthy adults are 14-18 g/dL for men and 12-16 g/dL for women. As a rough guideline, hemoglobin should be about one-third the hematocrit. Mean Corpuscular Hemoglobin (MCH) and MCH Concentration (MCHC): the amount or concentration, respectively, of hemoglobin in an average red blood cell. Mean Corpuscular Volume (MCV): the average size, or volume, of individual red blood cells. Conditions such as iron deficiency can lead to smaller than normal red blood cells, while certain vitamin deficiencies and some drugs can produce larger than normal cells. Red Blood Cell Distribution Width (RDW): a measure of the size and uniformity of red blood cells. White blood cells (leukocytes) carry out the body's immune responses. The CBC looks at numbers of various different types of white blood cells. White Blood Cell Count (WBC): the total number of white blood cells in a quantity of blood. A healthy adult normally has 4,000-11,000 white blood cells/mm3. A WBC increase often indicates that a person is actively fighting an infection or has recently received a vaccine. Decreased WBC (leukopenia) can leave a person vulnerable to various pathogens and cancers. Differential: a report of the proportions of different types of white blood cells as a percentage of the total number of white cells; these percentages may be multiplied by the WBC to obtain absolute counts. Neutrophils: a type of cell that fights bacterial infections. Neutrophils normally make up about 50-70% of all white blood cells. The risk of bacterial infection increases when the absolute neutrophil count falls below about 500-750 cells/mm3. Lymphocytes: there are two main types of lymphocytes. B cells produce antibodies that fight foreign invaders in the body, while T cells target infected or cancerous cells and help coordinate the overall immune response. A normal lymphocyte count is about 20-40% of all white blood cells. Monocytes: a type of cell that fights pathogens by engulfing and destroying them. Monocytes circulate in the blood for about 24 hours; when they leave the bloodstream and migrate into the tissues, they mature into macrophages. Monocytes and macrophages normally account for 2-10% of all white blood cells. Eosinophils: cells that play a role in defense against parasites and in allergic reactions. They normally make up 0-6% of all white blood cells. Basophils: another type of cell involved in allergic reactions, in particular the release of histamine. They normally account for 1% or less of all white blood cells. Platelets (thrombocytes) are necessary for blood clotting. A normal platelet count is about 130,000-440,000 cells/mm3. Low platelet counts (thrombocytopenia) -- which can lead to easy bruising and excessive bleeding -- may be caused by certain drugs, autoimmune reactions, accelerated destruction by the spleen, or certain immune diseases. 1- Go to the "Find a Location" page to find the closest Labcorp location. NOTE: We serve all states in the U.S. except New York, New Jersey, Massachusetts, New Hampshire, Rhode Island, Maine, Vermont, and Hawaii. 4- Pay using a credit card or Paypal. 6- Print lab request form attached to the lab request form email (PDF file). 7- Take that form to the closest lab with a picture ID. Get your blood drawn. No lab fee is required. 8- Your results will be emailed to you within 5-7 business days (depending on the test). Note: You can also download them when they are ready by going to your account and clicking on My Labs.